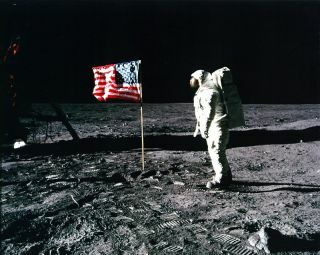 Apollo 11 astronaut Buzz Aldrin stands on the lunar surface during the first moon landing in 1969. The moon, Earth's closest celestial neighbor, has been an object of wonder and mystery since time immemorial. Scientific missions over the centuries have peeled away layers of that mystery, but the moon continues to harbor many secrets. NASA's latest foray into lunar exploration is the Grail mission, a two-spacecraft expedition set to launch Thursday (Sept. 8) to map the moon's gravity in unprecedented detail. 1609: Hans Lippershey invented the telescope. Galileo Galilei is credited with discovering the first four moons of Jupiter. 1610: Italian astronomer Galileo Galilei made the first telescopic observation of the moon. 1610: Thomas Harriot and Galileo Galilei drew the first telescopic representation of the moon. 1645: Michael Florent van Langren made the first map of the moon. 1647: Johannes Hevelius published the first treatise devoted to the moon. 1651: Giovanni Battista Riccioli named craters after philosophers and astronomers. 1753: Roger Joseph Boscovich proved the moon has no atmosphere. 1824: Franz von Gruithuisen thought craters were formed by meteor strikes. 1920: Robert Goddard suggested sending rockets to the moon. 1959: Soviet spacecraft Luna 2 reached the moon, impacting near the crater Autolycus. 1961: President John F. Kennedy proposed a manned lunar program. 1964: NASA's Ranger 7 produced the first close-up TV pictures of the lunar surface. 1966: Soviet spacecraft Luna 9 made the first soft landing on the moon. 1967: NASA's Lunar Orbiter missions completed photographic mapping of the moon. 1969: Apollo 11 mission made the first landing on the moon and returned samples. 1969: (Nov.) Apollo 12 made first precision landing on the the moon. 1972: Apollo 17 made the last manned landing of the Apollo Program. 1976: Soviet Luna 24 returned the last sample to be returned from the moon (to date). 1990: NASA's Galileo spacecraft obtained multispectral images of the western limb and part of the far side of the moon. 1994: NASA's Clementine mission conducted multispectral mapping of the moon. 1998: NASA's Lunar Prospector mission launched. 2007: Japanese SELENE (Kaguya) spacecraft launched. 2007: Chinese Chang'e 1 lunar orbiter launched. 2008: Indian Chandrayaan 1 moon orbiter launched.